Halloween is arriving in a mere 12 days and it is all my kids can talk about. We are decorating the house and getting ready for the festivities. For example, check out this Banana Ghost! Doesn't it look delicious? And, it was created in my kitchen from ingredients that I already have in the house. Grab a banana, Cheerios, and chocolate chips (optional) and have yourself a healthy snack. 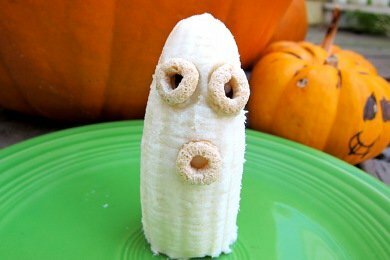 Bananas turn brown quickly so banana ghosts are a good snack for kids to make for themselves when they want it. Think of all the other parents who will be amazed at your brilliance for just grabbing this stuff out of your kitchen and creating a craft project. Yeah, you are a ROCKSTAR! Take THAT Martha Stewart. I was inspired to make these treats after I saw this article: 21 Gross Recipes: Halloween Party Food on Parenting.com. Most of the treats in this article are DISGUSTINGLY fun. Check out the, "Dead Man's Finger Food Sandwiches" - ugh, yuck, blech. Put apples on a stick (without the caramel). You will be amazed when your kids don't notice the missing candy. Cut up some apple slices and stick almond pieces into them to make teeth. Slice hard boiled eggs into halves and put a raisin (or an olive piece) in the middle for an "eyeball". Be creative and you can create all sorts of weird stuff with healthy ingredients. You might not even miss the candy! Got any fun Halloween snack ideas? Please share. Chocolate Pumpkin Protein Bars - YUM! Can A New Drink Change Your Life? Have to say that ghost is a laugh a minute. How about homemade popcorn balls or dates with a almond stuck in the middle. That is so adorable! My kids will love it! These ideas are way too cute! I wish I had discovered your site earlier so I could be making some of these all week...guess I'll be heading to the store to get some of the extras to try them--or we may extend our Halloween week through next week.